There's a traditional approach to this two-berth from Bailey caravans – does the Pegasus Genoa work for you? Some years ago, Bailey Caravans used its Pegasus range to launch its pioneering Alu-Tech construction system. This is designed to provide you with a much more robust and weatherproof bodyshell by, for example, reducing the number of external joints – a key point of water ingress – by 90%. It has certainly been well received, if Bailey’s sales are anything to go by. So for this season we thought we would see by checking out the 2017 version of the baby of the range, the Genoa. The major difference between the Bailey Pegasus Genoa and its main competitors is immediately apparent when you see it: the huge central window. The front panel is also much more vertical than you might be used to – the side profile of this caravan is definitely more like a rectangle, less of a trapezium. That should not make a huge difference to towing however. The door is a stable door, a relatively rarity these days. And you’ll appreciate exterior access to the underseat areas – although you’ll find out why later. Even relatively agile people should be pleased to have a grabhandle by the door, although this one looks a bit cheap. However, two hooks for coats and a mirror are useful touches. But turn left to face the lounge and you will immediately see what a great difference having that large window makes. It floods the whole area with light. While it does curve over, its blind has a useful secure stopping point just beyond the curve, so you should never be bothered by a glaring sun. It’s just a shame that you can’t open that window more than three inches to enjoy the fresh air. The brightness from the window, and from two skylights that run down the centre of the van, is complemented by the Mendip Ash furniture and by the upholstery, which is standard Richmond - a pretty leaf pattern - on our test model. There are useful shelves in the front corners of the lounge, with speakers and a stereo. Come night-time you’ll find that the size of the central window means it has no curtain, which can look as if something is missing. Still, you get very generous curtains for the other windows, with ties that are part of the curtain, so they won’t ever fall off down some cranny – handy. Three LED lights and four spotlights (which is generous for a two-berth) should keep things bright inside. Halfway down the van on the nearside is a sideboard unit with a smaller set of drawers next to it, and a magazine rack above. This sideboard includes two discreet sockets and a 12V socket, so it would make an ideal place for a TV. But there are no USB ports anywhere in this tourer. As for the lounge's freestanding table, it is light and easy to use, but it’s stored right at the other side of the kitchen. The kitchen workspace in this two-berth Bailey caravan is solid and of average size, if you include the extension flap, which you would probably have to use to house a kettle thanks to the position of the mains socket. The area is well lit, and you also get easy access to the Truma control panel from here. You get a four-burner dual fuel hob and a large sink, under which is a huge cutlery drawer and a double cupboard. A pan locker sits under the separate Thetford oven and grill. Between this and the unit housing the 103-litre Dometic fridge, 800W Daewoo microwave and another small cupboard is a slip of a cupboard that includes two bottle holders. However, I suspect you might struggle getting wine bottles out of there. Immediately in front of here is a trapdoor giving access to the battery, only you won’t notice this with the carpet in situ. There are five overhead lockers in the kitchen area, easily distinguished from the other overhead lockers in the van because they come with push-stops rather than handles. They are not shelved, however, and we found the doors to them heavy – they frequently slammed. The separate shower in the Bailey Pegasus Genoa's end washroom is large and comes with its own rooflight and shelving, even if it does have only one drain hole. The cassette toilet is in the middle at the back, immediately beneath an unfrosted window and next to a small sink with a large cupboard underneath. The best bit of the washroom is the wardrobe/storage space to the left of the toilet. This is a double cupboard with shelves on one side and a hanging space on the other, which you can usefully extend to full hanging height by removing a trapdoor. Bailey’s clever Dream Sleep system that continues in the Pegasus range for this year really does provide you with a flat, easy-to-assemble, comfortable mattress. You just fold the underside of each base cushion over to create a mattress top. The front chest stays where it is, but you still get a double bed that’s 1.90m long and 1.60m wide. Alternatively, you can leave the sofas as they are and use them as two single beds, each of which is over six-foot long. The only trouble with that arrangement is that you’ll need to remove the backrests to make full use of the two-foot width, so you need to stow them somewhere. The four overhead lockers in the Bailey Pegasus Genoa's lounge are all shelved, and come with dividers which are designed to carry loads better. Unlike the overhead lockers in the kitchen, they come with elegant chrome handles. However, the underseat lockers are less straightforward. You remember that both have external access doors? That's great. But you can’t access them internally except by lifting up the seat bases, and even then there is no gas support system to hold the bases up while you lift things out. That’s a shame, because these two areas are largely free of clutter. 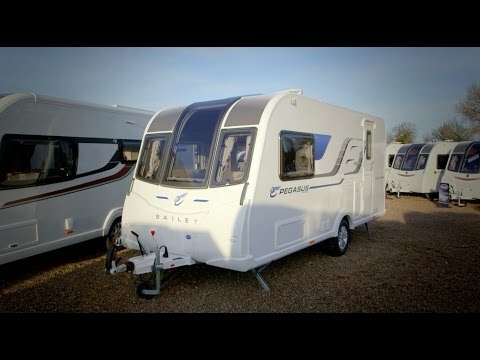 The 2017 Bailey Pegasus Genoa beats much of its immediate rivals in having a huge amount of window space that lets the light flood in. It’s comfy too, and well equipped. The trouble is it’s also slightly more expensive than much of that competition, and that means that the extra amount you would need to fork out to get a caravan with Alde heating is smaller.